The final volume of this surreal saga is out! As a fan of cult cinema and horror movies, I’m drawn to the strange, surreal and macabre. Some of my favorite movies are ones very few people have even heard of. I think that’s why Tegami Bachi struck a chord with me. It’s a manga that isn’t afraid to “get weird” and defies Shonen Jump norms in a number of ways. It has the atmosphere of a surrealist art film, but with a tinge of horror. It’s also got a lovable cast of characters and some goofy comedy mixed in as well. Mangaka Hiroyuki Asada manages the difficult feat of combining all these elements together to create a memorable tale that will stay with the reader long after reading. And it’s got giant bugs. It’s a scientific fact that any story can be improved by adding giant bugs. One of the most intriguing things about Tegami Bachi is the mangaka’s previous manga was a very straightforward basketball manga called I’ll. The art and story are so drastically different; it doesn’t even seem possible that it was drawn by the same guy. This makes me like the series and respect the mangaka even more. Being able to completely change your art style and create a story so radically different than your first series is a feat worth admiration. 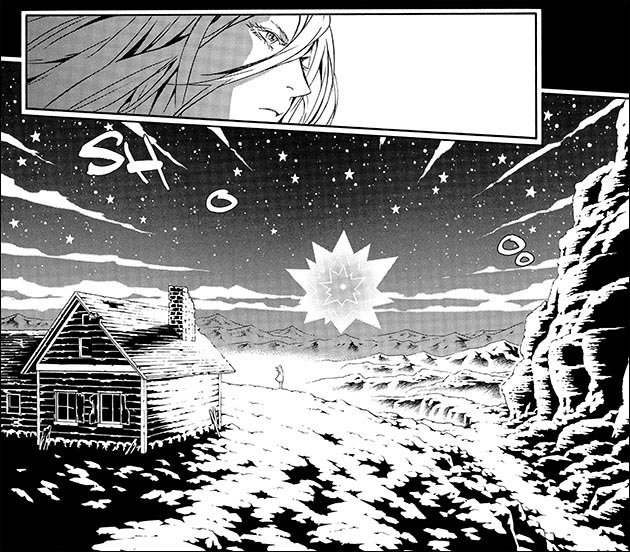 Tegami Bachi takes place in a dark and bleak world called Amberground. Many years ago, the sun went out plunging the world into eternal darkness. Luckily, scientists were able to construct a man-made sun that lights up parts of the land. The rest is still dark and plagued by giant insects called Gaichuu. The only way villages can communicate is by mail, but delivering mail between villages is dangerous due to the Gaichuu. Brave individuals called Letter Bees carry the letters, which can be anything, even humans, and keep the world connected. That’s the basics of the story, but it’s more complicated than that. The focus of the series is the concept of “Heart.” The only guns than can penetrate the Gaichuu’s thick armor (Gaichuu’s kanji translates as Armor + Bug) are special guns that fire Shindan bullets…bullets made of Heart. What exactly is “Heart?” I dunno! As far as I can tell, it’s not fully explained in the manga, but purposely left vague. It’s definitely tied to love, emotions and determination. And people, as well as objects have it. Letters definitely contain heart, because someone took the time and effort to write them and put their “Heart” into it. Gaichuu are attracted to Heart, which is why they attack Letter Bees. 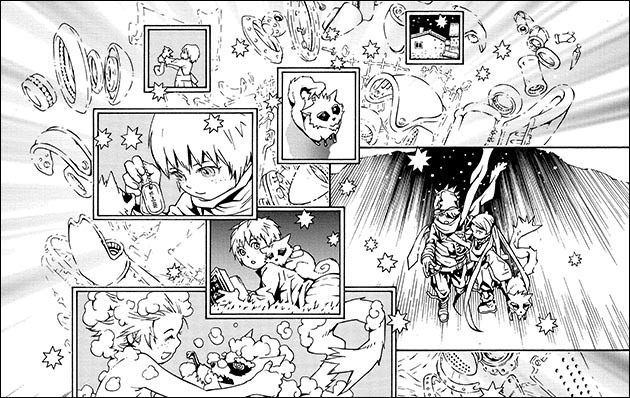 Heart is the central theme of the manga and threads through the entire fabric of the story. Aside from Heart, many things in the manga are mysterious or left purposely vague. And that’s not a bad thing. It’s up to the reader’s imagination to fill in the blanks and it’s a lot of fun to think about all the possibilities in this strange world. Much of Amberground is shrouded in darkness, both literally and figuratively. The star of the manga is Lag Seeing. A highly emotional boy with a penchant for crying. A lot. So much, it becomes an in-joke in the manga. He has a special eye given to him by his mother made of spirit amber. This unusual eye works as a power booster for his Shindan and has the ability to release the memories of whatever he shoots. When this happens, Hiroyuki Asada’s artistic flair really shines as the way he’s chosen to illustrate an explosion of memories is genius. 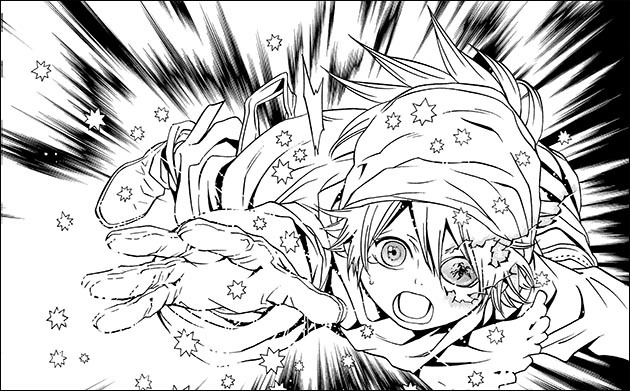 Shindan attacks release a ton of little sparkly stars, which are an artistic theme that’s repeated throughout the entire series. In fact, these sparkly stars are an echo of the giant artificial sun that lights up much of the land. But when Lag’s bullets hit, the stars are everywhere and form cascading boxes that resemble manga panels and show memories of powerful emotions from the past. This not only looks cool, it's used as a storytelling device to show the events that have shaped many of the characters’ lives. And anyone around the memory explosion can see it, not just Lag. Lag is joined in his quest to deliver letters and solve the mysteries of Amberground by a memorable cast of characters. 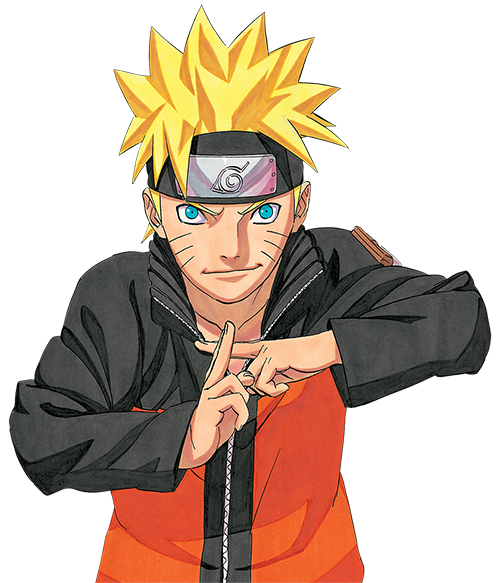 His main cohort is a little girl named Niche who has special hair that she can control and turn as hard as steel. She also forgets to wear underwear and has a weird dog-like thing that likes to eat her head named Steak. Like many things in this manga, there is more to Niche than meets the eye. She starts out as Lag’s “Dingo,” which is usually an animal that helps Letter Bees fight Gaichuu, but as the series progresses, it's revealed she's something quite special. One of the delightful eccentricities of this manga are the unusual names many of the characters have. For instance, Lag’s hero, a legendary Letter Bee, is named Gauche Suede. Then there’s Lloyd Largo, the director of the Beehive, the organization in charge of Letter Bees. And the list goes on with other names like Zazie, Chalybs Garrand, Hazel Valentine and more. 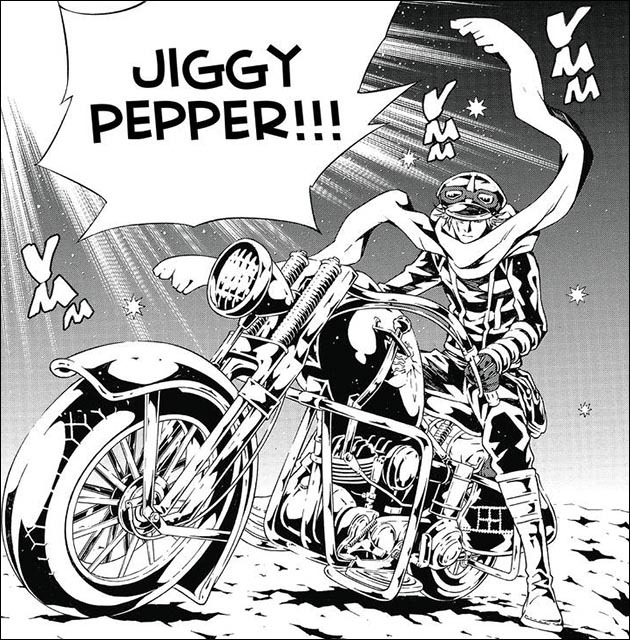 But my favorite name of all is Jiggy Pepper. Jiggy Pepper! That’s a name I’ll never forget! And he plays a major part in the manga, so it’s mentioned quite a bit. In the beginning of Tegami Bachi, the story is episodic as Lag and Niche (and Steak!) go from village to village delivering letters and helping people. Amberground is a harsh place and many of the people they encounter have tragic backstories. But as the series progresses, the mysteries of Amberground are peeled away, layer by layer like a giant onion until the final mystery is solved in an epic conclusion. I respect a series that has a lot of mysteries and actually takes the time to address them. 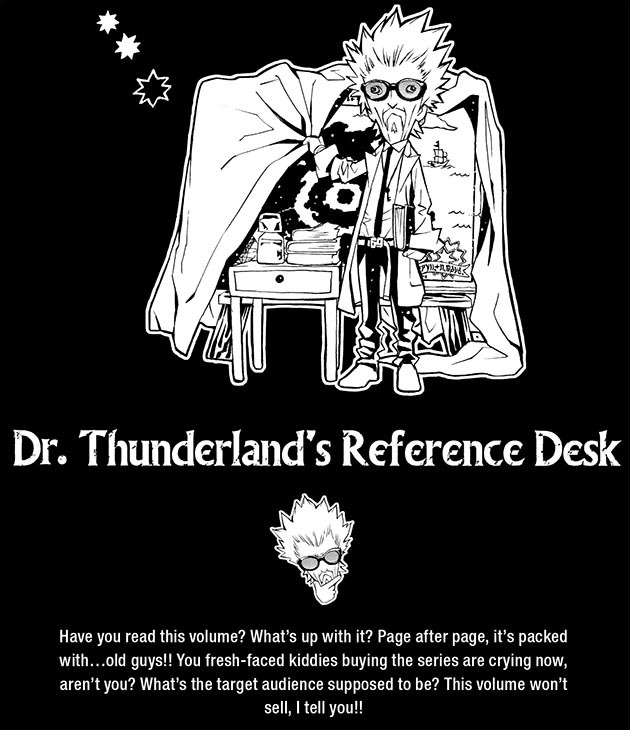 While Amberground is a mysterious place, the extras in the volumes will help explain a great many things by way of the humorous Dr. Thunderland's Reference Desk section. This is basically a glossary that breaks down the specifics of new concepts introduced into the story. It’s also kind of meta as Dr. Thunderland talks directly to the reader and kind of takes on a life of his own. The art in the series is unlike any other manga I’ve read. It’s fantastic. The use of extreme contrast gives the series a bold dramatic look. It often looks more like an etching or a wood print rather than a manga page. 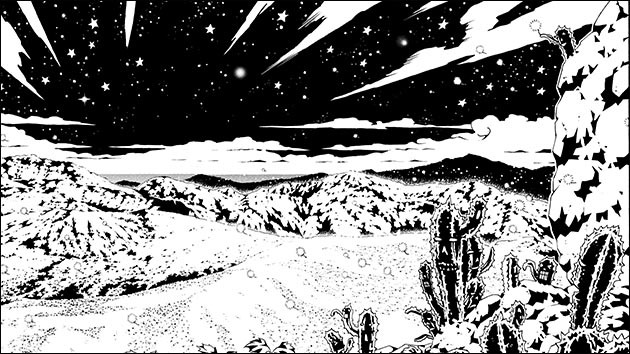 This extreme contrast also illustrates the harsh environment the characters live in with the artificial sun casting intense shadows across the land. You can practically feel the starkness of the place they inhabit. The character designs also warrant mentioning. The Letter Bees dress like 1920’s newsboys complete with scarves, long jackets, and the classic newsboy hat. It actually makes sense, considering they deliver letters which carry news of the land between the people. The overall fashion of Amberground feels very early 19th century. As does the general technology, with horse drawn carriages and steam engine trains being the main source of transportation. The Gaichuu designs are also as stylish and striking as the rest of the manga. 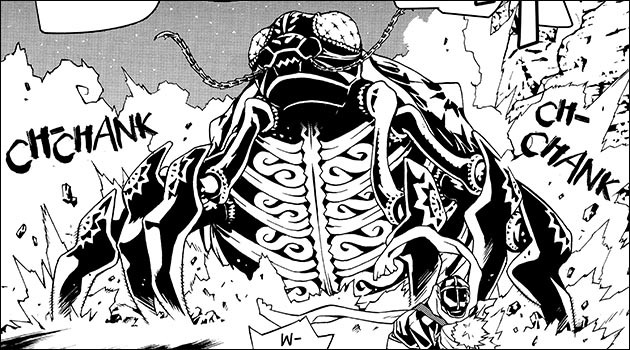 The Gaichuu are massive, with their bodies made of hardened black armor segments that glisten in the harsh Amberground light. While they are definitely based on insects, they’re quite fantastic and varied. 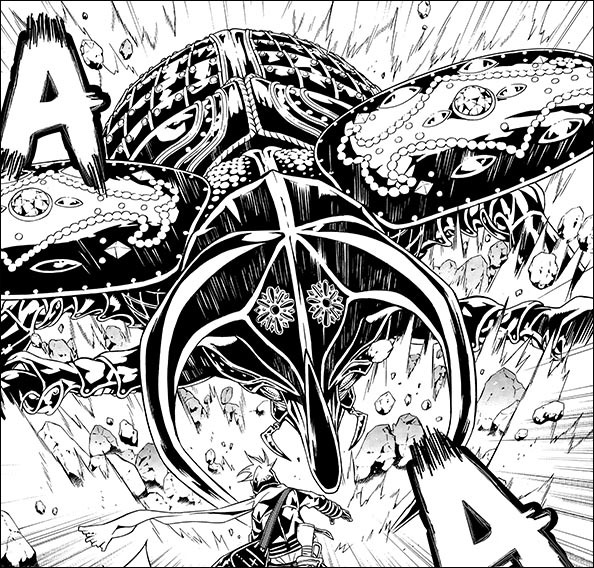 These are some of the most interesting creature designs found in any manga. And they’re scary looking! Hiroyuki Asada’s keen eye for detail and illustrative style forges all of these different design elements together to create a surreal, but thoroughly believable world. And one that’s unlike any other in the manga, or for that matter, any other medium. 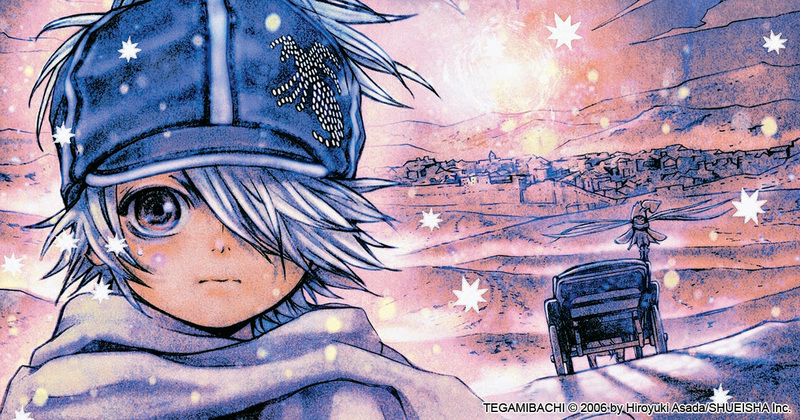 Visually, as well as story-wise, there’s nothing quite like Tegami Bachi . And the last bit of praise I’d like to heap on the pile is--this manga's a lot of fun! Despite the heavy themes and ever-present threats, there’s plenty of humor and goofy moments that keep the series from getting bogged down and collapsing on itself. 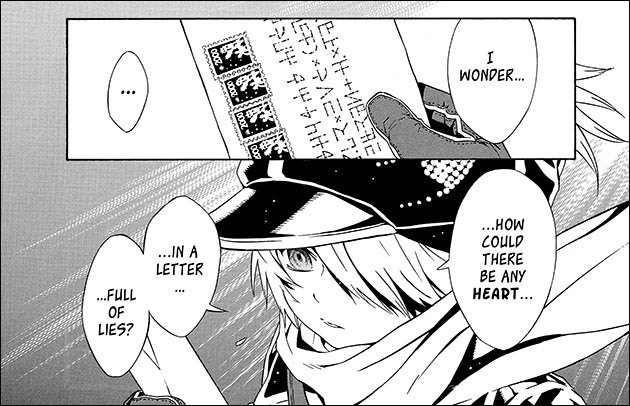 To put it plainly, Tegami Bachi’s a trip, bro! If you wanna get into something weird and cool, this is it. 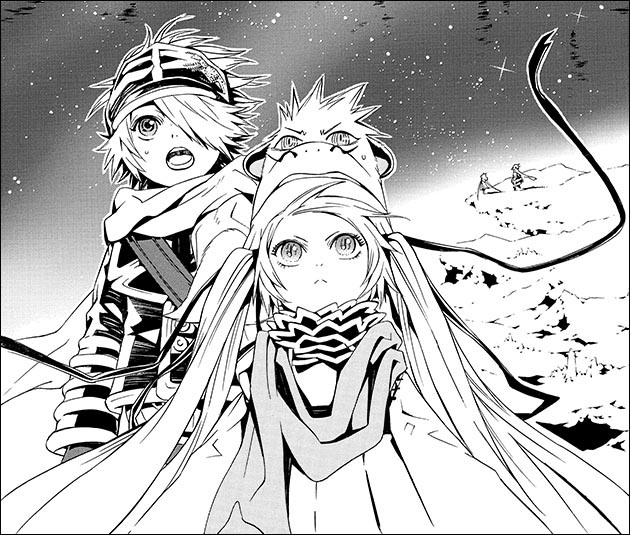 Volumes 1–20 of Tegami Bachi are available here!